Bible days are here again! I. The first sign to hit the church during a Move of God is THE FEAR OF THE LORD. 1. The Fear of the Lord causes believers to not mess around with sin. 2.The Fear of the Lord is the major missing piece today in many camps. 3. Touch not mine anointed, and do my prophets no harm. 4. Don’t talk bad about God’s men and woman who are serving Him. A. Only when The Church today walks in the Fear of the Lord and in Holiness, in Love will we see miracles signs and wonders. B. Once we walk in the fear of the Lord, God is free to move mightily in our midst. IV. Complete Prosperity came as a result from a move of God. A. Only by prayer can we maintain the anointing and move of God. VI. Singleness of heart, total contentment. A. They had some joy. A. The Lord added to the church daily (not Sunday) such as were to be saved. Before there was an Azuza Street, there were the great revivals led by the great revivalist Charles Finney. Charles Finney knew about revival, how to start one, and what were the ingredients in a great Revival. We can earn a lot from these great revivals, but the Bible records the First Holy Ghost Revival that became a soul-winning, church planting army. Before Charles Finney’s Revivals there was The Day of Pentecost; when one hundred and twenty (including Mary the mother of Jesus) were waiting for the Promise of the Holy Spirit. They were promised by the Lord Himself to be clothed with a Power from on High. They were told to wait until they received this baptism of Power, this baptism of the Holy Spirit. To be “endued” literally means to be clothed; and “power from on high” literally translates into passion.Passion is another way of expressing the fire of the Holy Ghost. The Prophet John the Baptist declared that Jesus would baptize with the Holy Ghost and Fire. The Passion and Fire of the Holy Ghost was imparted to the disciples on the day of Pentecost as they were baptized in the Holy Spirit. To be baptized literally means to be saturated, to be immersed and completely filled. The disciples would not be effective unless they had the Fire and Passion of the Holy Ghost as a result of this baptism. As we see the effectiveness of the church in the book of Acts, it is all because of Passion, because of the Fire of the Holy Ghost. That burning Passion moved the church to do many works with a zeal that could not be stopped. Titus 2:14 declares that Jesus redeemed us that we might be a “zealous” passionate on Fire people. The only way for us to get fired up and zealous for good works is to receive our day of Pentecost and receive the Baptism of the Holy Ghost and Fire from the Lord Jesus Christ Himself for service. The effects of the Fire of the Holy Ghost are many, it revolutionizes the one whom the fire comes to. It revolutionizes the minister; in Acts 4:33 it declares that the apostles gave witness of the resurrection with great Power, great passion and Fire. This Fire caused the disciples to spring into action. They could not just sit back and watch their generation go to hell. They possessed a true understanding of the passion that Christ had for humanity. When our lives catch fire and are consumed with passion our greatest desire will become ” God, here am I send me”. The effect of this Fire of the Holy Ghost will stir you up to a point that you cannot keep from being involved, you cannot help but “Go Ye”. When we are consumed with passion we will be compelled by the Love of God to go beyond ourselves. The Passion and the Fire of the Holy Ghost will motivate us to believe God for big things, and will ignite our imagination and creativity. We will take the limits off of God and ourselves. Christ like passion wakes you up in the morning, keeps you rejoicing during the day and causes you to dream big dreams when you lie down at night. The Fire and Passion of the Holy Ghost will also cause you to become deeply devoted and earnest about your mission. It will also cause you to become extremely determined to be successful in your efforts. It will also cause you to become bold and courageous no matter how much adversity you may experience. It will also cause you to become persevering, no matter how long it takes to accomplish the mission God gave you. The Vision that the Lord has given the church takes a Passion, a Fire and Zeal to accomplish. Before we go and try to do anything for the Lord, before we try to do our part of His Vision we must get Powered up with the Holy Ghost. We must wait until we are clothed with power from on high. We must seek the Lord and get our Power Clothes on. Jesus is the Baptizer of the Holy Ghost and Fire, Go to Him and ask for a Real Deal Baptism to accomplish your work for him with an on Real Zeal and Passion that will get the job done. In ministry the #1 key ingredient is the Holy Ghost. We cannot do the works of the ministry on our own efforts and emotional zeal but only by the supernatural Grace from on high. God’s Supernatural Grace and Zeal will empower us to reach this generation with the Good News of the Gospel of Jesus Christ with signs that follow. Catch the Vision and Fire of the Holy Ghost today and seek Him until you are ignited with the Fire of God! Be Stirred Up, Ignited and fanned into a Flame again and Spread the Fire from House to House – Fulfill the Acts 20:20 Vision. Ignite the Fire of God in your home, church and city. 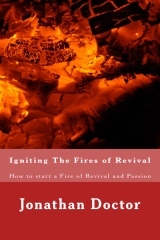 start Fires wherever you go and be a Holy Ghost Arsonist and Stir up the fires of revival. Like when a Fire starts to go out and becomes ashes… you must stir up the logs in order to get the flame going again…. you must poke at it and stir it up. Likewise Stir up the Gifts of God – the Flames of God- The Passion of God within you and your fellow brothers. We need this Fire going again in order to win souls and spread the Gospel…. In Acts 19:2 Paul asks a group of people who appear to be believers a question. He asked, “Have you received the Holy Ghost since you believed?” That implies to me that it is possible to be a believer and still not receive the Holy Ghost. Otherwise, why would Paul even ask such a question? Have you received the Holy Ghost since you believed? When you get saved, the Holy Ghost comes into your heart and begins living inside you at that point. But the Holy Ghost does not necessarily have control of your life at that point. It’s as if I went into your home and stood in the doorway, but I’m not in the rest of your house. And I can’t go into the rest of your house until you let me, until you receive me into the rest of the house. It’s only when I go into the rest of the house that I can say that I have an influence over the balance of your house. Act 19:2 He said unto them, Have ye received the Holy Ghost since ye believed? And they said unto him, We have not so much as heard whether there be any Holy Ghost. …………..
Act 19:6 And when Paul had laid [his] hands upon them, the Holy Ghost came on them; and they spake with tongues, and prophesied. The word receive is used 261 times in the New Testament It is the Greek word lam-ban’-o A verb, which is used: to take, to get hold of; to have – accept, catch, obtain, take. So with this in mind, Paul is saying in Acts 19:2, “Have you actually actively reached out there and grabbed hold of the Holy Ghost, have you made Him your own, have you received Him, have you accepted Him, have you caught Him, have you taken Him?” This is not something we just sit back and passively get zapped with. It is something that WE DO. If you believe in Jesus Christ you have the Holy Ghost IN YOU, but the LORD has more to give! We can be filled with to overflowing with the Holy Spirit, that’s what the “baptism in the Holy Ghost” is. It is another experience after believing in Jesus Christ and being born again, it is when the Holy Ghost flows out of us and is upon us for ministry. (John 7:37-38) The Holy Spirit IN us is mainly for us, the Holy Spirit UPON us is power for service, its for other people, God wants and needs us baptized in the Holy Ghost, so His work will be done on this earth. The reception, the receiving, the taking, the catching of the Holy Ghost is something we do. And that is an act of faith. We just haul off and do it. So here’s what we do. We recognize that the Holy Ghost is here, He came in this way at Pentecost, He’s never left yet, and He’s going to stay here. Now I have the choice to either accept Him as the third person of the Godhead or not. If I don’t, I don’t have his power. But if I do, I have His power and everything He brings with Himself. Ask Jesus to baptize you with the Holy Ghost, then receive, The Bible says you shall RECEIVE POWER AFTER the Holy Ghost comes upon you, and ye shall be witnesses for Jesus. (Acts 1:8) Faith is an act. It’s active voice. It’s something you do NOW, There’s always a NOW action involved. 2Co 5:19MSG God put the world square with himself through the Messiah, giving the world a fresh start by offering forgiveness of sins. God has given us the task of telling everyone what he is doing. 2Co 5:20 We’re Christ’s representatives. God uses us to persuade men and women to drop their differences and enter into God’s work of making things right between them. We’re speaking for Christ himself now: Become friends with God; he’s already a friend with you. You are the mouthpiece for God to a lost and dying world. The primary reason you have been filled with the Holy Ghost is so that your witness will be effective and powerful. Rom 10:14MSG But how can people call for help if they don’t know who to trust? And how can they know who to trust if they haven’t heard of the One who can be trusted? And how can they hear if nobody tells them? Rom 10:15 And how is anyone going to tell them, unless someone is sent to do it? That’s why Scripture exclaims, A sight to take your breath away! Grand processions of people telling all the good things of God! Act 2:1MSG When the Feast of Pentecost came, they were all together in one place. force- -no one could tell where it came from. It filled the whole building. Act 2:4 and they started speaking in a number of different languages as the Spirit prompted them. This “wildfire” move of the Holy Ghost continued and had a great impact on society. When you are truly empowered by the Holy Ghost, you are so filled you spill over to others and nothing can stop you but you. The Holy Spirit empowered the disciples to make their efforts effective. They became bold, courageous and determined to fulfill their mission, the great Commission. Mat 28:19 Go out and train everyone you meet, far and near, in this way of life, marking them by baptism in the threefold name: Father, Son, and Holy Spirit. You are to be a witness to everyone you meet, far and near. To fail to impact the world is to fail our mission. We have a Great Comission and a Great Responsibility that we will be accountable for on the Day we come before the Judgment Seat of Christ. We cannot even begin to try to do this great work without “Power from on High”. Receive the Power and be Be Enthusiastic about fulfilling the Call God has placed on your life. Stay enthusiastic and full of excitement about witnessing and ministering. Enthusiastic means in the Greek: To be packed full of God. Rom 12:11AMP. Never lag in zeal and in earnest endeavor; be aglow and burning with the Spirit, serving the Lord. Rom 12:11GW Don’t be lazy in showing your devotion. Use your energy to serve the Lord. Receive the Power from on High before you minister or go out to Minister and witness. The Holy Spirit should make you different so that somebody notices and says, “That person has been with Jesus” Remember, the primary reason you have been filled with and empowered by the Holy Spirit is so that your witness and ministry will be powerful and effective. If you believe you are one of God’s last Days ministers of Reconciliation make sure you have been TRULY FILLED AND EMPOWERED with the Holy Ghost. The Power from on High is to empower you to win souls, it is not just so you can sit in church and pray in tongues. The power from on High will move you to more than that, greater than that, it will move you to serve and win the lost at any cost.